Sometimes I can happily create art in silence – immersing myself in the sound of my brush scumbling on the canvas, being mindful with the process and completely living in the moment. However, there are other times where, if it weren’t for music, I would find myself with very little motivation and desire to create. It has a great affect on me. Depending on my choice of music, it can either chill me out, allowing me to paint in a more calming, relaxing manner or it can give me the momentum and energy that I need to keep going and to paint faster. It sometimes even pushes me to have a care-free perspective, encouraging me to take risks and be more daring with my work as a whole. Once I start painting to music, I find it hard to stop. I get lost in the moment – my painting movements find themselves in sync with the musical rhythm and sometimes I even catch myself singing [badly]. In short, music puts me in a more uplifting spirit and gets my creative juices flowing. Happy days! 2. My local art shop – Fred Aldous. 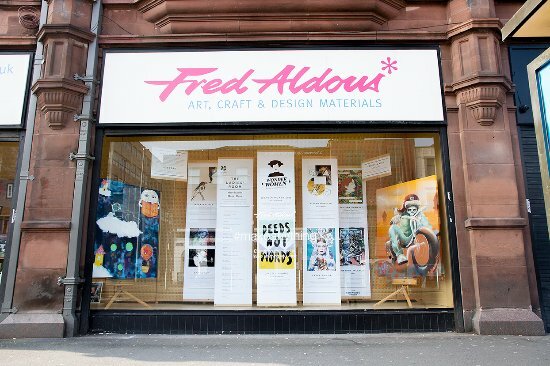 Fred Aldous is a fantastic art shop in the Northern Quarter which sells almost everything artsy! It was also one of my favourite places to go to this summer on my lunch hour – 1. because the Aircon was so refreshing during the heatwave we had [yes, for once we actually had a proper summer in Manchester!] and 2. I just love browsing through the quirky creations available in the more commercial area on the first floor. I first started selling my art on Depop, but unless it was less than £15, people just weren’t that interested. Since starting an Etsy shop, I’ve had more success in the past 3 months than in my 3 years’ selling art on Depop. I’m so glad I did because it has allowed me to purchase better art supplies, continue creating and share my art with a wider audience. Instagram allows me to connect with artists and art lovers alike no matter where they are in the world, which is great for me personally because I love being able to learn from other artists and also share my work with people who I wouldn’t necessarily have had the pleasure of meeting if it weren’t for Instagram. Since my art is focused on beautiful scenery found across the globe, Instagram allows me to get inspiration from art and travel bloggers, and it even lets me see the world from the comfort of my own home! It is a must-have platform for Artists and I am truly grateful for the app and my followers who I love for being so fantastically supportive of me pursuing my passion. I hope you enjoyed my first blog post and, if you’re an artist, I’d love to know what things you can’t live without… Feel free to share your thoughts! As an artist I’d definitely agree that it’s impossible to live without music. Simply because the music we listen to will flow through us and out onto the paper (depending on the music). Great piece of art by the way! I posted yesterday about tips to make your workplace a more productive work environment, could you take a look and follow if you thought it was a good post? Thanks! What a thought-provoking question! I will ponder it a bit and come up with answers. I can tell you one right now — paper towels or other cleaning rags! I make such a mess when I paint. 🙂 I love the question, and I’m happy to follow your blog. It was a great post. After Inktober is over and I get back to “regular” blog posts, I would love to share a link to your “5 Things” post and make a similar post of my own. Would it be all right if I shared your link? Watch for my “5 Things” post sometime in early November! Thanks for following ZimmerBitch and introducing me to your blog. Looking forward to seeing more. Thanks Jessica I am looking forward to seeing more of your lovely work.